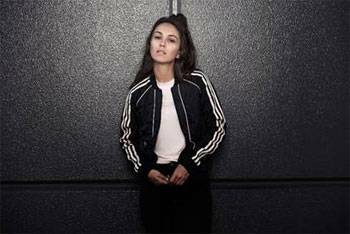 Gold Coast singer-songwriter Amy Shark releases her highly anticipated new single I Said Hi. The track is the first single off her upcoming debut album entitled Love Monster, which is set for release on July 13th and is available for pre-order now via Wonderlick Recording Company/Sony Music Entertainment Australia. Fans who pre-order the album will receive I Said Hi along with Shark's breakout song, 3 x Platinum Adore as an instant-grat upon purchase. Having just returned home after an extensive tour of Europe and North America – with sold out shows in major cities like Germany, London, New York, Los Angeles and Seattle – Amy returns to Australia to launch her next single I Said Hi as well as her full-length album debut, Love Monster. Working again with producer Dann Hume, I Said Hi is about overcoming adversity and the struggles we face in our day-to-day lives. Shark's road to airtime and awards nights was less than glossy"her story is another kiss goodbye to the myth that anyone can just make it overnight. "I was in this really tragic band and when it fell apart I kept going", Amy comments. "I got a few little, tiny hints of like, 'Oh, you know, you might get somewhere,' and it was enough to keep me hungry…this song isn't just about one's struggle to succeed; it's an anthem for anyone who is waking up everyday fighting for what they believe in and challenging the universe!". After years of hard work, Shark was finally able to commit to being a full time musician – Her hit single Adore soared to the prestigious #2 spot on Triple J's Hottest 100, and Shark took home 2 x ARIA awards for Best Pop Release and Breakthrough Artist at last year's ARIA Awards. Her debut EP Night Thinker exploded into the top 10 on iTunes in 15 countries and she became the first-ever Australian Apple Music Up Next Artist, a title that launched her onto the stage of The Late Late Show with James Corden, The Tonight Show Starring Jimmy Fallon, and into a new era she can only describe as "crazy and surreal". I Said Hi is the first track off Shark's upcoming debut album, Love Monster, which she describes as "ten times bigger and better" than the Night Thinker EP. If anyone can top it, she can. "There's a lot of love and demises and tales. It's like my diary has opened up to another 13 more songs", says Shark. Stream/purchase I Said Hi now.